British Pie Week 2016 - which runs from Monday 7th March to Sunday 13th March - is now just 4 weeks away and we're busy at Pierate HQ making our final pre-pie-rations for the big event! And the exciting news is that this year the British Pie Awards will be happening in British Pie Week too! British Pie Week 2016 is from 7th to 13th March! Some of you may well have come across British Pie Week before, which has in fact been around since 2007 as the ingenious marketing spin off of pastry company "Jus-Rol" - and they have managed to bag the lucrative web domain www.britishpieweek.co.uk to encourage pie makers up and down the land to get involved. We're also pleased to see they're once again taking British Pie Week a bit more seriously this year by maintaining a dedicated @BritPieWeek twitter account! And we certainly can't deny we have benefited from the ease of picking up some quality Jus-Rol pastry from the supermarket to make some homemade pies in the past! We aim to be the pie experts you turn to for all your pie rating and eating needs during British Pie Week and beyond! With over 500 pies rated and reviewed on our unique 7 Cs pie rating system, we commend pies to you, tell you which ones to avoid, and give you the low down on what we think makes the perfect pie! We'll also once again be lending our services to the British Pie Awards as we help judge the pies on 9th March. So whatever pie (or pies!) 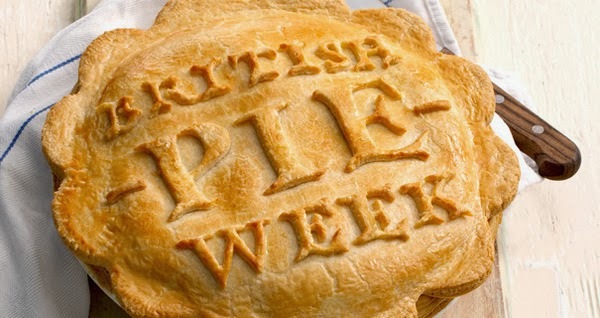 you enjoy in British Pie Week, we hope it's a good one that rates well on the 7 Cs of pie rating! If you need any ins-pie-ration, you can of course see the hundreds of pies we've rated on our pie blog via our Pie Rankings or our Pies Categorised! Of course you know where to come for all the latest pie news this year, but why not reminisce about the 71 pies we ate for British Pie Week 2015? !